You wake up in the morning and look across the beautiful bay just as the sun peeks over the mountains. 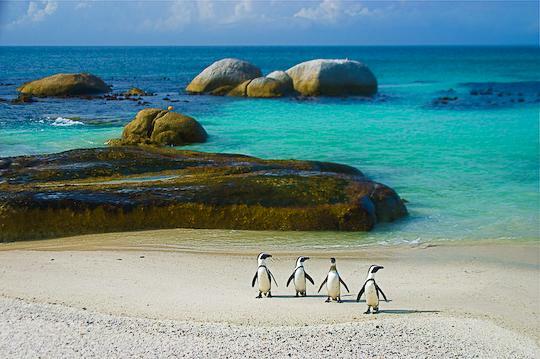 Walking down the road to the coast you encounter penguins waddling towards the clear, cool sea. Out of the corner of your eye you see three otters running along the beach and launching into the waves. Raising your eyes as you walk along, you see a Southern Right whale breeching for the pure joy of it. You must be in Simon’s Town. Just a short walk up the road and you are in the Table Mountain National Park. The Old Mule Track zig zags up through the pristine fynbos. Just past the Blockhouse you suddenly notice the Erica quadrisulcata – one of the plants that are endemic to this particular mountain-side. On the way you stepped over a beautiful but dangerous puff-adder, scared several dassies and a mongoose, and saw the delicate footprints of a little duiker. Looking along the hazy blue mountain chain of the Peninsula you are thankful for the South Easter that keeps the City’s pollution at bay. Down in the sea, ahead of a graceful Navy frigate, gannets are diving on a shoal of fish driven to the surface by dolphins. You must be Simon’s Town. The church bell rings as you turn up the stone steps, under the overhanging plants, and look up at the renovated cottages in the narrow lanes. The winding path leads you behind the historic buildings whose facades you admired on the Main Road and past the most southerly Mosque in Africa. Looking up you can see the Waterfall flowing strongly after the rains. You look down into the Dockyard, quiet on a Sunday, and notice the flotilla of small yachts sailing out past the lighthouse. The only question now remaining is “which coffee shop shall we go to for breakfast?” You must be in Simon’s Town. A gaggle of primary school children rush past you onto the Jetty. The excitement is high. Stuffed into their orange life-jackets they are going on a boat tour of the harbour. The visiting American students climbing into their hired kayaks look up at them and laugh, while further down the jetty deep-sea divers keep their distance as they don their black wet suits and clamber into their ski-boat. You walk back to the Square past a life-size statue of a dog. You must be in Simon’s Town. The Naval parade culminates in a 21 gun salute and the enthralled crowd disperses into the many enticing little shops. It is time to explore the museums and galleries. But where to start? A choice of different museums, numerous historical sites and art galleries, all within strolling distance. But the children want a train ride to Glencairn to explore the Vlei – maybe they will see one of the new-born goslings, or a leopard toad splashing into the Els River! You must be in Simon’s Town. The sun turns the mountains mauve the end of a perfect day. Some had cycled along the beautiful coast to have breakfast at Dixies, some played scenic golf at the Country Club, while others enjoyed the beach. Now is the time to relive the excitement of the trip out to Seal Island, the thrill of seeing a Great White Shark. You look up from your drink to see the perfectly rounded, yellow, full moon slowly rise up over the mountains. Its shimmering light on the sea picks out a dark submarine returning to harbour. You know you have enjoyed another perfect day in Simon’s Town. But sometimes a broader reality intrudes. Simon’s Town is primarily a Naval base and strategic needs over-ride all other legislation. It is also a working commercial dockyard with the noise and disruption that brings. Guns are tested, generators hum, and foreign sailors explore our streets. 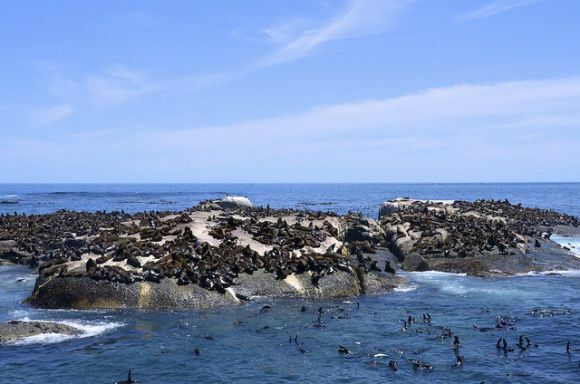 Strong south-easters blow sand across the roads and railway lines, fishing boats disturb the pre-dawn peace, penguins can be noisy, smelly neighbours, and homes have to be protected from wily baboons. Worst of all, mountain fires are a frightening reality. These, too, are all part of living in Simon’s Town.